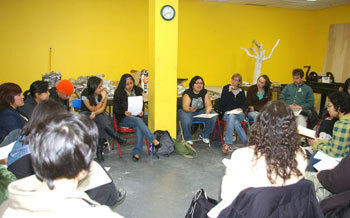 Workshop on Youth Involvement in Leading Immigrant Rights Struggles at Convention in Defense of Immigrant Rights in Chicago planned April 12 event to build May Day actions. CHICAGOA Midwest Convention in Defense of Immigrant Rights, held here March 8-9, brought together more than 200 workers and students from across the region to plan actions for legalization on May Day and respond to attacks against immigrant workers. The conference was organized around three demands: legalization of all immigrants, residency with civil and labor rights, and a halt to raids, deportations, and other acts of intimidation. We need to work to get the unions to support the May Day actions this year, said Jorge Mújica, a leader of the March 10 Movement and organizer for the United Electrical Workers. He pointed to several examples in the Chicago area where workers have successfully fought company attempts to fire workers over Social Security no-match letters. Twenty-five young people, most of them high school students, participated in a workshop on youth involvement in the immigrant rights struggle. Workshop participants are planning an April 12 citywide gathering where young people who want to organize for the May 1 march can come and speak out and learn, said Tania Unzueta, 24. A panel took up immigrant rights and the elections. Speakers were Socialist Workers Party candidate for U.S. president Róger Calero, Green Party candidate for U.S. Congress in Illinois District 4 Omar López, and Shaun Harkin from the International Socialist Organization. Later in the conference Mújica listed the positions of all the Democratic and Republican party candidates in the presidential election, pointing out that all of them support the border wall and none of them call for legalization of the undocumented. Workshops were also held on the fight against racism, the North Atlantic Free Trade Agreement (NAFTA), fighting anti-immigrant laws, and the impact of the war on the fight for legalization. A workshop on organizing a Washington, D.C., lobby day May 1 discussed a proposal for legislation that would give five-year renewable visas to undocumented workers. Emma Lozano of Chicago immigrant rights organization Sin Fronteras (Without Borders) said the Congressional Hispanic Caucus is expected to introduce this legislation in March. Jesse Diaz, a professor at University of Illinois Chicago, urged delegations from major cities where May Day marches are organized to be part of the lobbying effort in Washington. Others spoke to the need to keep organizing visible actions in the streets. The conference concluded with a call to unions, community organizations, and activists to organize a massive march on May Day in Chicago, with the participation of workers and immigrants from all the Midwest states, and to organize local demonstrations across the Midwest.